I’ve never actually had pineapple upside-down cake (I know!) but the flavor profile has always sounded appealing to me. So why not apply it to dinner? Pineapple contains Bromelain, a protease that is used commercially to tenderize meat, which makes its juice the perfect chicken marinade. Place chicken in a large, flat container and cover with pineapple juice. Cover and place in the fridge for 2-3 hours to marinate. Preheat your oven to 350 degrees Farenheit. Prepare a casserole dish with baking spray. Remove chicken from juice (return the juice to the fridge) and place into the casserole dish. Bake 30 minutes. 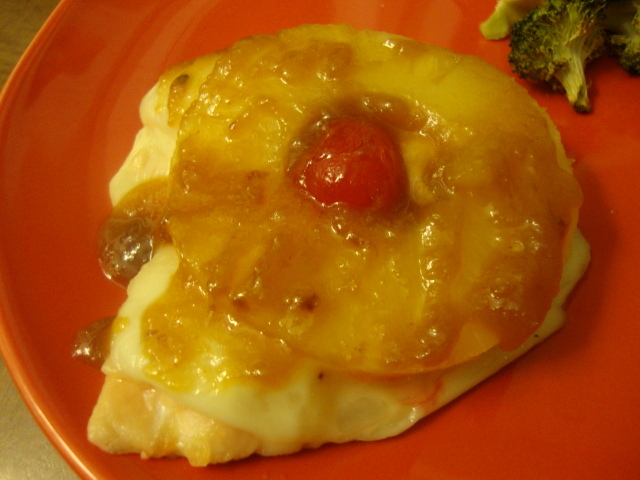 Remove chicken from oven and top each piece with one slice of cheese and one pineapple ring. Place a cherry in the center of each ring. Sprinkle rings evenly with brown sugar and salt. Return to oven and continue to bake for 10 minutes. Meanwhile, pour juice into a small skillet over high-heat. Add tamari sauce and hot sauce. Bring to a boil and cook until reduced by half. ***Because the juice was in contact with raw poultry it is essential that you keep it at a boil for at least 5 minutes! Pour sauce evenly over cooked chicken.